Wall-to-wall knowledge on how carpet is manufactured. Knowing how carpet is made can be very advantageous. It enables you to understand the product’s materials right from their birth. Remember that these are materials you will be living with, and on, should you choose to have carpet installed in your home. Knowing the different materials that make up various carpets also helps you understand and evaluate their performance aspects: why certain carpets are easier to install, why some wear better, longer, and why others are easier to care for and clean. Plus, perhaps most important, understanding carpet manufacturing and materials can make you a smarter shopper, help you better determine carpet value and keep you inside the borders of your home improvement budget. Now, before we take you through how carpet is made, remember that, when selecting carpet, thicker is not always better. What you need to look at is the construction of the carpet. You want a tight twist in each yarn, not loose and frayed at the end. A firm, dense pile is also the mark of a quality carpet. How to check the density? Bend a corner of the carpet and see how much backing shows. The more backing you see, the less dense and durable the carpet. And for high traffic areas, consider lower profile carpets that won’t have the potential to matte and crush. But we’re getting ahead of ourselves. To start at the beginning, check out our materials and manufacturing story that follows. To understand carpet is to know about fiber. Fiber is the basic material that a carpet is made up of. Over ninety percent of all of the carpet made today is made up of synthetic fiber. The rest is natural fiber, most commonly wool. First, let’s look at the most common synthetic fibers. Synthetic fibers are usually made up of one of three materials: nylon, polypropylene or polyester. All three are created by similar chemical processes using oil and natural gas. Almost 75% of carpet today is made of nylon and, compared to the other fibers below, it performs the best overall. Nylon is the leader in: appearance retention, fade and heat resistance, soil and stain resistance, and color and styling. The highest performance nylon is Type 6.6, which has a tighter molecular construction, making the carpet more resistant to stain penetration. Polypropylene is popular and naturally resistant. The next most common material used in carpet manufacturing is polypropylene. Introduced in the late 1950’s in Italy, polypropylene BCF has seen fast growth over the last twenty years, and today represents more than thirty-five percent of the total fibers used in the carpet industry. While polypropylene is not as resilient or resistant to abrasion as nylon, it is naturally stain and fade resistant. Its natural resistance to moisture means that it must be dyed before being extruded, resulting in a more limited range of color options. 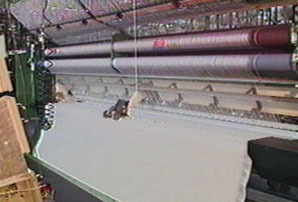 Polypropylene is most often used in loop pile carpet constructions. The third type of material commonly used in carpet manufacturing is polyester. Polyester was introduced to the carpet industry in the mid 1960’s, and has been well accepted for its bulkiness, color clarity, and good stain and fade resistance. While not as resilient as nylon, Polyester fiber carpet constructed with today’s new technologies can be a good performer. Wool is natural but expensive. The above three materials make up the majority of synthetic fibers. The other type of fiber used in carpet construction is staple fiber. While some synthetics are used in the creation of staple fibers, the original staple fiber used in the making of carpet is wool. The wool used in today’s carpet comes primarily from New Zealand, Argentina, and the United Kingdom. Since wool is a natural fiber, it ranges in color from off-white to black, with many earthen tones between. Berber, now considered a type of carpet construction, actually comes from the name of a group of North African sheepherders called the Berbers. The Berbers were known to produce very coarse wool, with characteristic color flecks in their yarns. Although wool doesn’t stand up to abrasion and moisture as well as synthetics, it cleans well and is known to age gracefully. Wool is the most expensive carpet fiber, and represents less than one percent of the U.S. carpet market. How carpet is made is a 3-part process. There are basically three steps to manufacturing carpet. The first step is tufting. Tufting begins with the process of weaving the synthetic or staple fiber into a primary backing material. The primary backing material is usually made of woven polypropylene, and its main value is to provide a base cloth to hold the yarn in place while the tufting happens. The tufting machine looks like a really big sewing machine. It has anywhere from 800 to 2000 needles working in concert to pull the yarn through the primary backing material. The typical tufting machine sits about 12 feet wide, and as its needles penetrate the backing, a small hook called a looper grabs the yarn and holds it in place. This process results in what is called loop pile construction. Loop pile products hold their appearance exceptionally well. Since there are no exposed yarn tips, only the sides of the yarn are exposed to wear and stress. Generally speaking, low profile loop carpet stands up to heavy traffic best. Here, an alternative step may occur. In some carpet styles the looper then rocks back against a knife, where the small loops of yarn are cut, creating what we call a cut pile carpet. The length of these cut pieces of yarn is referred to as the pile height, and is basically the distance between the looper and the primary backing. These precision cuts are controlled by a computer, and are sometimes programmed to cut only some of the loops. This method of selectively cutting, called cut and loop construction, creates a recognizable pattern on the surface of the carpet. Now let’s pause in our construction story to identify and explain some terms and construction variables that you may want to know about while making a carpet purchase decision. Pile height, or nap, is the length of the tuft measured from the primary backing to the yarn tips. It’s usually shown as a fraction, or sometimes its decimal equivalent. Usually shorter pile heights are more durable than longer pile heights. The stitch rate of a carpet is the measure of how close the yarns are together. Stitch rate is measured in penetrations, or tufts, in a given length of carpet, usually an inch. 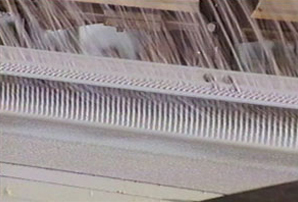 The stitch rate is controlled by how fast the carpet is moved through the tufting machine. Seven to eight tufts per inch is a good number, while three or four is pretty poor. Face weight is determined by the actual amount of fiber per square yard, and is measured in ounces. A typical carpet may have a face weight of 35 to 45 ounces for example. Finally, density is a measure of how tightly the yarn is stitched into the primary backing. Higher density carpet will typically wear better than low density carpet. The second step of carpet manufacturing is the application of dye. Now the carpet is taken through one of two dyeing processes. The first method of dyeing is called yarn dyeing, or sometimes pre-dyeing, where the color is applied to the yarn prior to tufting. The advantages of all yarn dyeing methods include good side-by-side color consistency, large lot sizes, and uniformity. The second method involves applying color to the yarn after the carpet has been tufted. This method is called carpet dyeing. There are several carpet dyeing methods in use, each producing a unique end result. 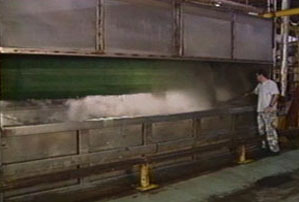 The first technique, often referred to as Beck, or batch dyeing, involves stitching the ends of the carpet together, and then running the tufted carpet loop through large vats of dye and water for several hours. The Beck process is ideal for smaller production runs, and heavier face weight products. 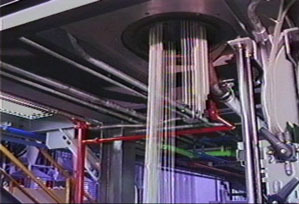 Continuous dyeing is a similar process to Beck dyeing, but involves running the carpet through several processes in addition to just the dye application. Continuous dyeing applies the color directly to the carpet face by spraying or printing. This process is also used to create multicolor or patterned effects in the carpet. Screen printing is another common method of carpet coloring, where color is applied through anywhere from one to as many as eight silk-screens. The major benefits of carpet dyeing, that is dyeing the carpet after the tufting process, are greater color flexibility, and lower cost. The third and last step in the manufacturing of carpet is the finishing process. This process is typically a single production line that completes the final stage of the carpet construction. In the finishing process, a coating of latex is applied to both the tufted, dyed carpet’s primary backing, and also to secondary backing. Secondary backing is typically made of a woven synthetic polypropylene material. The two parts are squeezed together in a large heated press, where they are held firmly to preserve their shape. Shearing, one of the last stages in the manufacture of carpet, is the process of removing all of the little loose ends and projecting fibers that might have been created during the tufting process. It also helps achieve the yarn’s tip definition of the finished carpet. Finally, each carpet is carefully inspected for color uniformity and other manufacturing defects before it is rolled, wrapped, and shipped. That’s our story on how carpet is made. We believe that the right knowledge can be as functional and practical as carpet itself. We also hope that the information we’ve featured here leads you to a better understanding of how this beautiful and versatile product is created, and helps you be a better, smarter, more savvy carpet shopper.